On February 14, Nikolas Cruz shot and killed 17 people at Marjory Stoneman Douglas High School in Parkland, Flroida. It sparked a new gun control surge. 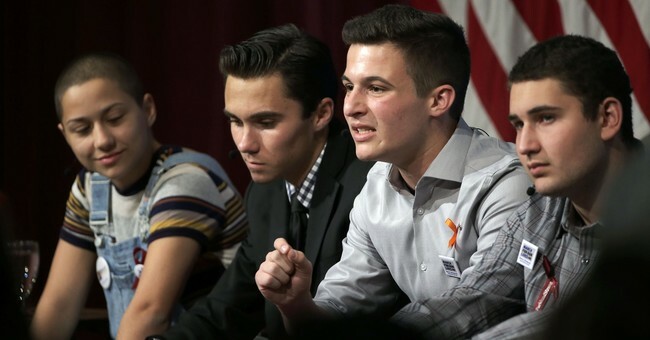 The Parkland Three—David Hogg, Cameron Kasky, and Emma Gonzalez—are the point people leading the latest anti-gun charge, which has yielded political dividends. Florida increased the age to purchase firearms to 21 and banned bump stocks, the former provision being legally challenged, as it should, by the National Rifle Association. The NRA has also been targeted. In Vermont, Gov. Phil Scott, who carries an A-rating with the NRA, signed a bill that expands background checks, bans bump stocks, raises the age to purchase firearms to 21, and limited magazine sizes. In Deerfield, Illinois, a Chicago suburb, gun owners are now subject to a $250-$1,000/day fine for non-compliance to the latest ordinance: the banning of owning so-called assault weapons within the village limits. Those are any semiautomatic that carries more than ten rounds and of course, AR-15 rifles. They have to be transferred outside of Deerfield, destroyed, or surrendered to the authorities. New gun control measures used to be contained to blue states. Now, we have GOP governors caving. University of Tampa junior Casey Bauer believes this is the year that his peers will make a difference at the polls. But just last week he struggled for the attention of fellow college students during a registration drive, even with his offer of bacon-sprinkled mini-donuts. “Sorry, I’m carb free,” a University of Tampa student said as she hustled by Bauer, also a field organizer for the progressive NextGen America. Across six of the seven largest counties, there were 4,500 fewer registrations among 16- to 25-year-olds compared to the same point in 2014. The largest county, Miami-Dade, could not provide historical data for registrations. The numbers counter a popular narrative since February’s deadly massacre in Parkland that asserted there was an awakening among teens and young adults. This theory was bolstered by local and national rallies on gun violence, orchestrated high school walkouts, and an unusual number of young candidates who filed to run. Yet even in Broward County — where 17 high school students, teachers and staff died in a February shooting that sparked a national movement to stop gun violence — there are fewer new registrations. About 6,300 16- to 25-year-olds in Broward signed up to vote since the start of the new year, 2,700 less than during the same period in 2014. Political organizations and campaigns, especially progressive ones, are betting activism produced by Parkland will translate to more votes when Floridians choose their next governor and U.S. Senator. But so far at least, the groups haven’t harnessed that energy with get-out-the-vote efforts because it’s early in the campaign cycle, said Democratic consultant Reggie Cardozo. A looming obstacle: young voters remain difficult to mobilize. In 2014, turnout for voters under 30 was the lowest for any modern mid-term. So, yes, it’s the same old story. The most liberal parts of the country are anti-gun. They’re more vocal, but that doesn’t mean the rest of the nation is as mobilized to support new gun laws. Florida is ground zero for the latest gun control push, and it seems young voters, the ones who will lead this revolution and right the wrongs of the older generation, don’t care. Maybe things will pick up, but I doubt it. Barack Obama was a candidate who could mobilize youngsters and get them to the polls. With him, yes, there is a permanent Democratic majority, but this isn’t it. This could be yet another exercise in which we see the media hubs of D.C., Los Angeles, and New York making something bigger than it actually is. So, is this a revolution? No. At least not the nationwide frenzy anti-gunners and the media try to make it out to be. It’s a low-level, state-based insurgency that’s claimed a few victories, though ones that can be reversed with new governors and legislatures.